A Russian rocket soared into the cosmos Thursday carrying the Sochi Olympic torch and three astronauts to the International Space Station ahead of the first-ever spacewalk for the symbol of peace. Video streamed by the U.S. space agency NASA reported a flawless docking with the space station about six hours after the craft blasted off from Russia’s manned space facility in Baikonur, Kazakhstan. The unlit torch for the 2014 Winter Olympics in the Russian city of Sochi is to be taken on a spacewalk Saturday, then return to Earth on Monday (late Sunday EST) with three departing space station astronauts. 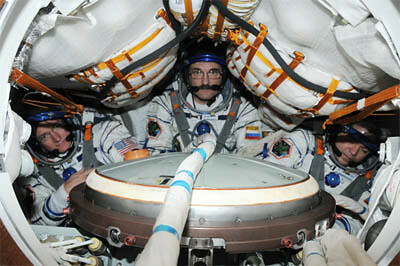 The arriving crew members Thursday were Russia’s Mikhail Tyurin, American Rick Mastracchio and Koichi Wakata of Japan. Once the newcomers enter the space station following a long hatch-opening process, the orbiting lab will have nine people aboard for the first time since 2009. 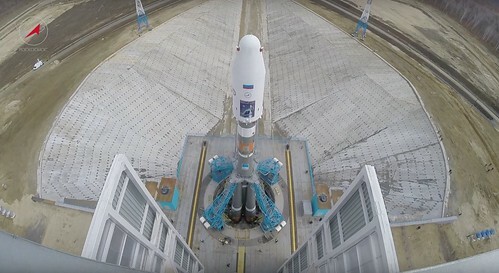 Fyodor Yurchikhin of Russia, NASA’s Karen Nyberg and Italian Luca Parmitano are the crew scheduled to return to Earth with the torch via a Monday landing on the steppes of Kazakhstan. The Olympic torch will not burn onboard the space outpost because lighting it would consume precious oxygen and pose a threat to the crew. The crew will carry the unlit torch around the station’s numerous modules before taking it out on a spacewalk. The Olympic torch was taken aboard the U.S. space shuttle Atlantis in 1996 for the Atlanta Summer Olympics, but this is the first it time it will be taken outside a spacecraft. 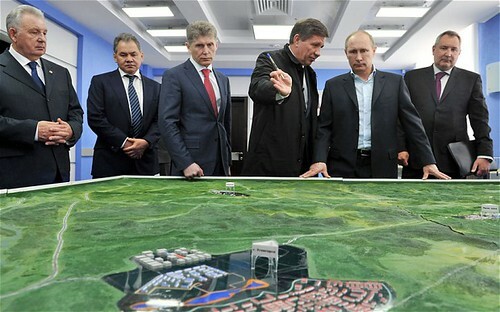 “It’s a great pleasure and responsibility getting to work with this symbol of peace,” Tyurin told journalists on Wednesday before the launch. Russians Oleg Kotov and Sergei Ryazanskiy will take the torch out of the space station on Saturday while American Michael Hopkins remains inside. The four-month Sochi torch relay, which started in Moscow on Oct. 7, is the longest in the history of the Olympics. For most of the 65,000-kilometer (39,000-mile) route across Russia, it will travel by plane, train, car and even reindeer sleigh. Some 14,000 torch bearers are taking part in the relay that stops at more than 130 cities and towns. Last month, the Olympic flame traveled to the North Pole on a Russian nuclear-powered icebreaker. Later this month it will sink to the bottom of the world’s deepest lake, Lake Baikal. In early February, it will reach the peak of Mount Elbrus, at 5,642 meters (18,510 feet) the highest mountain in Russia and Europe. The torch will be used to light the Olympic flame at Sochi’s stadium on Feb. 7, marking the start of the 2014 Winter Games that run until Feb. 23. 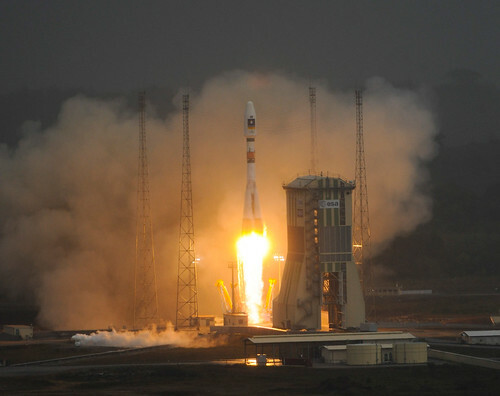 Soyuz lifts off for the first time from Europe’s Spaceport in French Guiana, carrying the first two Galileo In-Orbit Validation satellites. Soyuz Wanna Get Out or What? 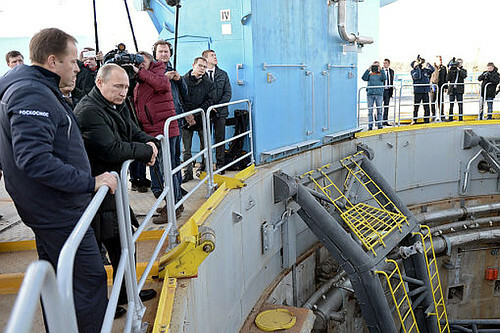 Looks pretty tight in there, comrade. I figure the thrill of orbiting Earth in the ISS is worth the cramped quarters while getting there — and back. Welcome home, Soyuz TMA-01M. Outgoing Expedition 26 commander Scott Kelly, Soyuz TMA-01M commander Alexander Kaleri and flight engineer Oleg Skripochka undocked from the International Space Station Wednesday, plunged back into the atmosphere and descended to a snowy touchdown in Kazakhstan to close out 159-day mission. With Kaleri at the controls in the descent module’s center seat, flanked by Kelly on his right and flight engineer Skripochka to his left, the Soyuz TMA-01M undocked from the Poisk compartment atop the station’s Zvezda command module at 12:27 a.m. EDT (GMT-4). 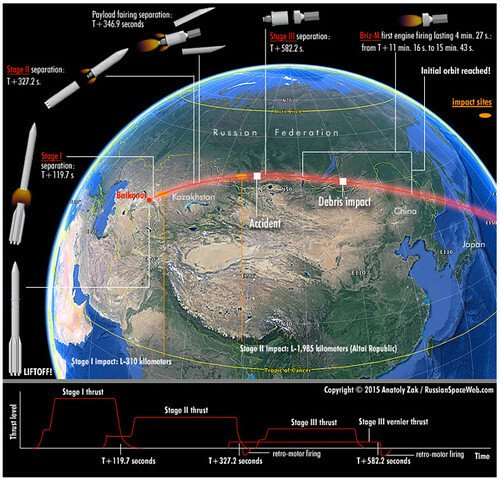 After testing repairs to the Soyuz avionics system, Kaleri monitored a four-minute 17-second rocket firing starting at 3:03:17 a.m., slowing the ship by 258 mph to begin the fall to Earth. The three modules making up the Soyuz TMA-01M spacecraft separated as planned just before atmospheric entry, and the central crew module carrying Kaleri, Skripochka and Kelly lined up for a fiery descent to a parachute- and rocket-assisted touchdown at 3:54 a.m. near Arkalyk in north central Kazakhstan. Braving blowing snow, brisk winds and temperatures in the 20s, Russian recovery crews and flight surgeons, along with a NASA support team, were standing by to help the astronauts out of the cramped Soyuz descent module. A few minutes later, Kaleri, Kelly and Skripochka had been pulled from the capsule and carried to reclining chairs. Grainy video from the landing site showed support crews bundling the crew members in blankets as they began their re-adaptation to gravity. Because of the brutal winter conditions, the recovery team planned to fly the trio to nearby Kustanai for initial medical checks and a traditional Kazakh welcoming ceremony.